It’s International Yarn Bombing Day! 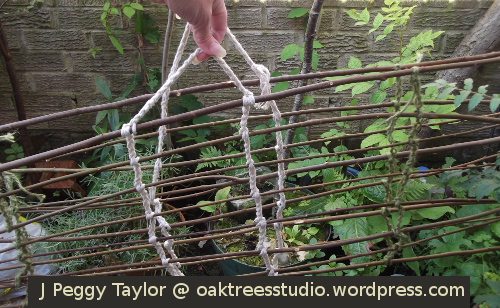 When fellow crochet fan and blogger, Daniella at daniellajoe.com, announced the imminent arrival of a special day for yarn bombing, I had been thinking about making a climbing plant support for my nasturtiums in my new willow basket planter. 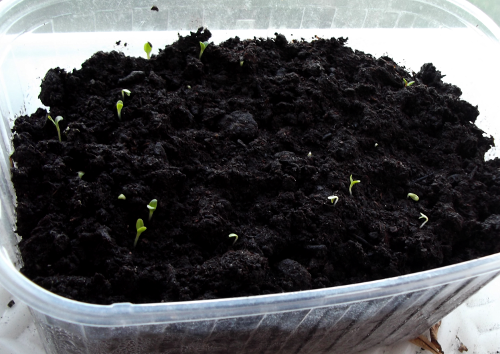 Nasturtiums are very easy to grow and are very bee-friendly plants. As our poor bees need all the help they can get these days, I’ve grown quite a few nasturtiums this year, both in my back yard and on the allotment garden. 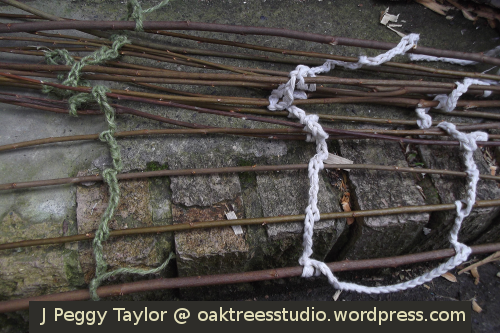 To celebrate International Yarn Bombing Day this weekend, I’ve been busy with my crochet hooks this week. 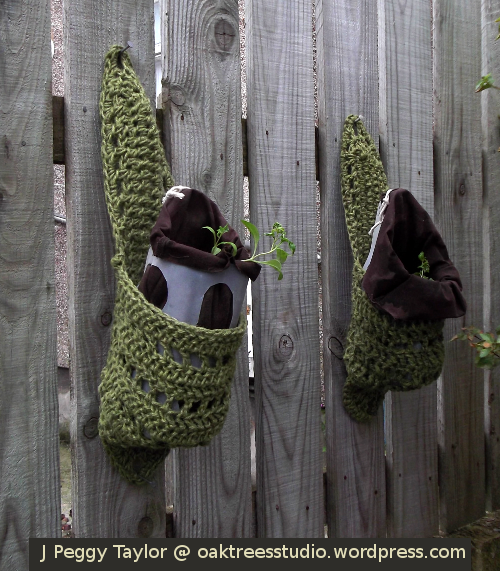 Daniella’s post inspired me to create a crochet concoction for my back yard that would serve a double purpose – firstly as a climbing plant support, and secondly to add a little instant colour to the wall space reserved for the growing nasturtiums. I did some back yard yarn bombing last year too and some of it is still going strong. 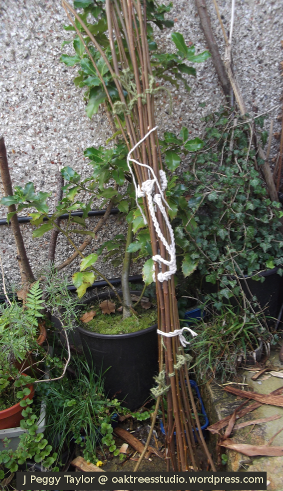 Making plant supports for me generally involves some kind of sticks and string. I happened to have some very rustic-looking hazel hoops to hand that I’d made last Winter … just in case they might be useful. They were perfect for my plan. 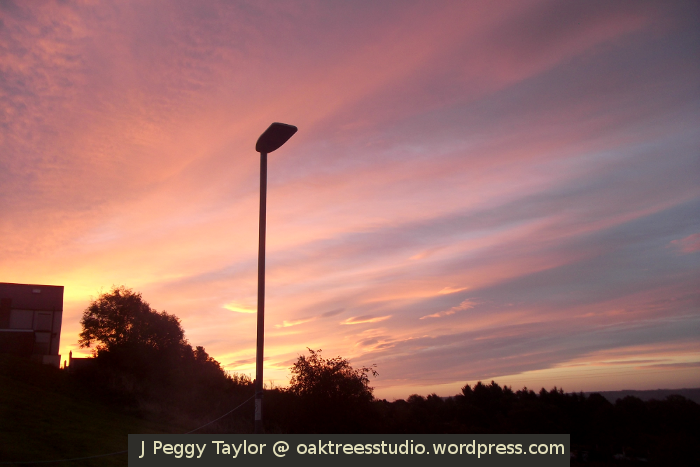 When I say ‘plan’ … I had an idea in my head. Making it a reality involved some free-form crochet. Taking a No.5 crochet hook and some jade green double knitting yarn, I fastened the two hoops together so that they overlapped. I continued to work right around each of the main side sections to provide a foundation row onto which I could attach the crochet mesh. I then began crocheting a wide mesh across the two main areas within the hoops. I liked the way the hazel twigginess added to the overall effect. Bright red and bright blue yarns make the centre section of the plant support really stand out. 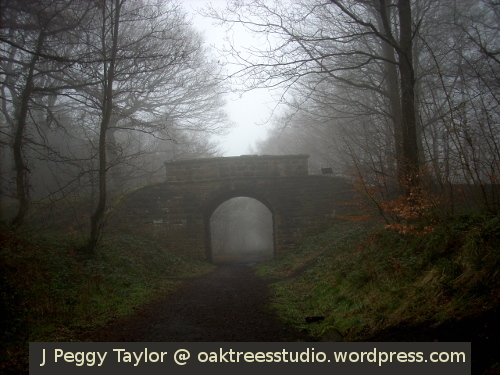 I just followed the shapes as they happened to be when the hazel hoops were overlapped. Whilst I’d crocheted a 6-chain mesh for the main side sections, I decided to use different crochet effects for the centre section. With the red double knitting yarn, still using a No.5 crochet hook, I worked a Solomon’s Knot-type stitch. For the smaller area of the centre section, I used a No.3 crochet hook with the slightly thinner blue yarn. I outlined the shape in blue chains first, catching them around the hazel hoops at intervals, then I added chains in a sun ray pattern. Yes! This is just how I imagined it! 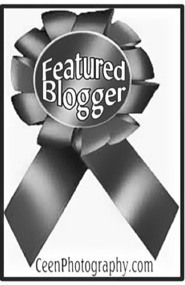 Now all I need to do is fix my yarn bombing creation in place on the outside wall. 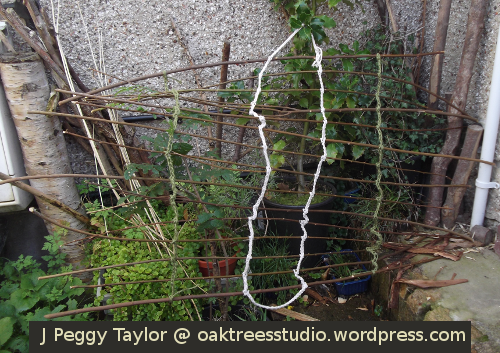 I created a couple of lengths of crochet chain using the jade green yarn to bind the hazel hoops onto the structure I already have in place above my willow plant basket. I’m pleased to say, the fixing in place of the nasturtiums’ yarn art plant support went smoothly and just as I’d planned. I also added some new colourful crochet ties to the front of my large willow basket planter as they needed a little sprucing up too. My hooky mat chair cover project has made some progress over the past two weeks, though not quite as much as I’d hoped. I found there were some aspects of the project that needed a bit more pondering to determine the best approach and I decided to make a temporary crochet chair cover to disguise our raggy old chair until I complete the new hooky mat chair cover. 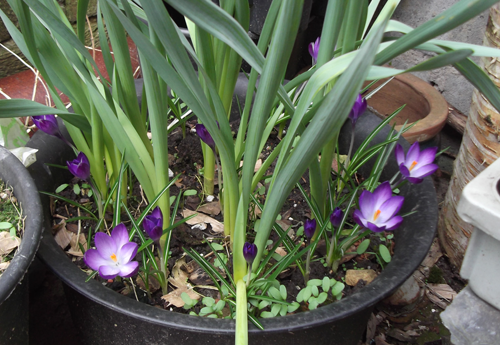 We have also enjoyed some sunny days just lately which tempted me to get on with a gardening project outdoors, so that was another diversion. But let me tell you about the progress have I made with my chair cover project. I introduced you to my new craft project in my earlier post and you may recall I had decided that the chair cover would have a Rennie Mackintosh/early 20th century theme but I was still working on the design. I continued making a number of sketches until I was happy with my sketch version of the design. Next, I squared up some recycled brown wrapping paper and drew up a full size version. 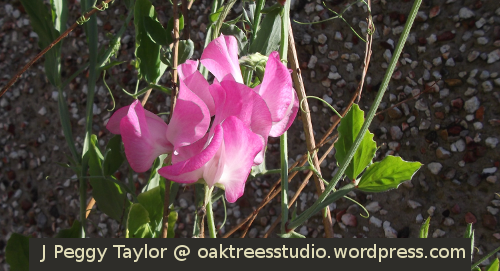 At this point I began to consider how best to transfer the design to my stretched linen. I had spent some time tinkering with the balance of the design so, to make sure I retained the placing of the flower elements, I decided to make a charcoal transfer rather than draw it freehand. To use the hooky mat technique to create the design on the linen, I wanted to keep the design fairly simple as this is my first hooky mat project. I have seen some marvelous examples of rugs and soft furnishings made using the hooky mat technique on Pinterest, but I didn’t want to be too ambitious just yet. Using a soft 4B pencil I made sure my design was clearly defined on the ‘shiny’ side of the brown wrapping paper. I used a dark charcoal pencil to trace over the lines on the reverse of the wrapping paper. When I was happy that I’d put enough charcoal on the back of the design to make the transfer work effectively, I carefully pinned the design – right side up – onto the stretched linen. Then using the 4B pencil again, I re-drew over the design. 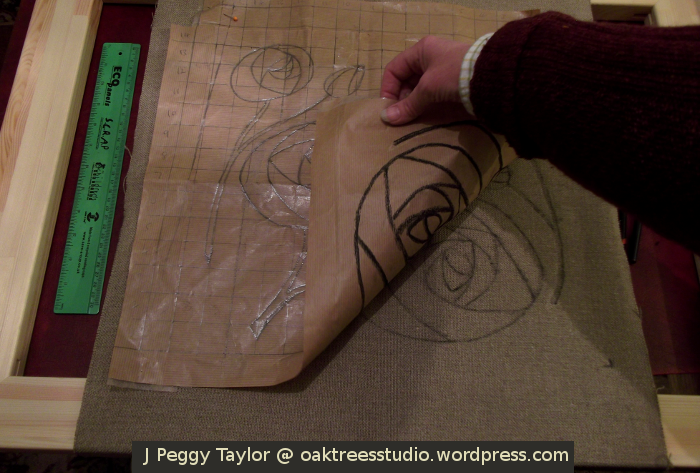 I put a block of wood underneath the linen to make this part of the transfer process easier. The transfer worked very well – all of the design could be clearly seen on the linen. My next step was to draw up the outer shape of the chair seat and to check there was enough material left to tack the chair cover to the seat base. Although I had measured the linen piece beforehand, at this stage I felt it would be better with another inch of tacking space on two of the sides. I decided to tack another slightly larger piece of linen onto the stretcher frame and re-do the design transfer process. This time I was happy with the design on the linen and with the spacing for fixing the new cover to the seat base. Now that I had the design on my base material it was time to think about the process of hooking the upcycled textile strips into it. I felt I needed to try out the hooking technique and my handmade hook tool itself. A test square seemed a good plan. 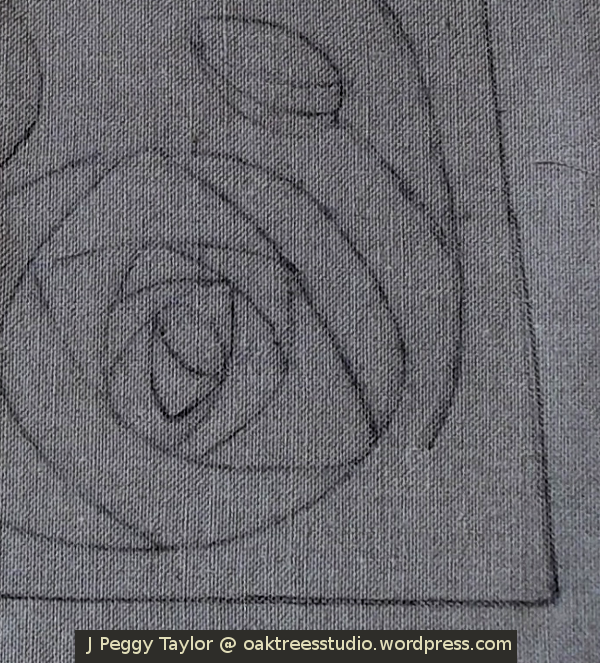 Using the charcoal transfer process again, I drew out a flower from my design onto a linen scrap. 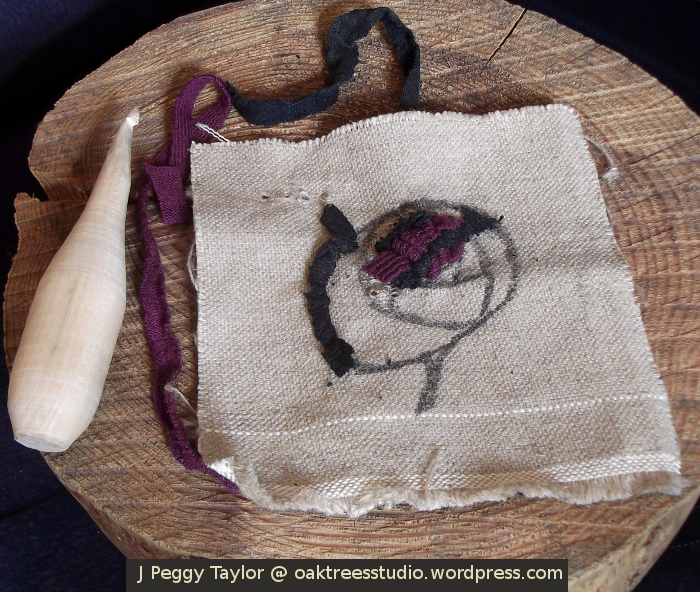 Then, taking my wooden hook tool, I began hooking in a textile strip. As I had anticipated, this was more difficult in the more closely woven linen than it would be in the open weave of jute hessian that is more frequently used as a base material for hooky and proggy mats. However, the hook tool proved robust enough for the task, though I did file the hook just a little extra to make it more effective. As I hooked the first textile strip into the flower shape, I realised that this 1.5 cm wide textile strip was going to be too wide to describe the smaller detail in the centre of my flower design as well as being difficult to work into the closely woven linen. I also noted that organising the hooked loops on the right side of the workpiece so that they lie in a given direction was an important skill I must acquire if the design was to look good when it was completed. A little more practice was definitely in order. It will take me a little while to become a natural with the hooky mat tool, so I decided in the short term our raggy old chair cover needed a rather more instant makeover. When I need to make something quickly I generally turn to my favourite hook tool, my crochet hooks. 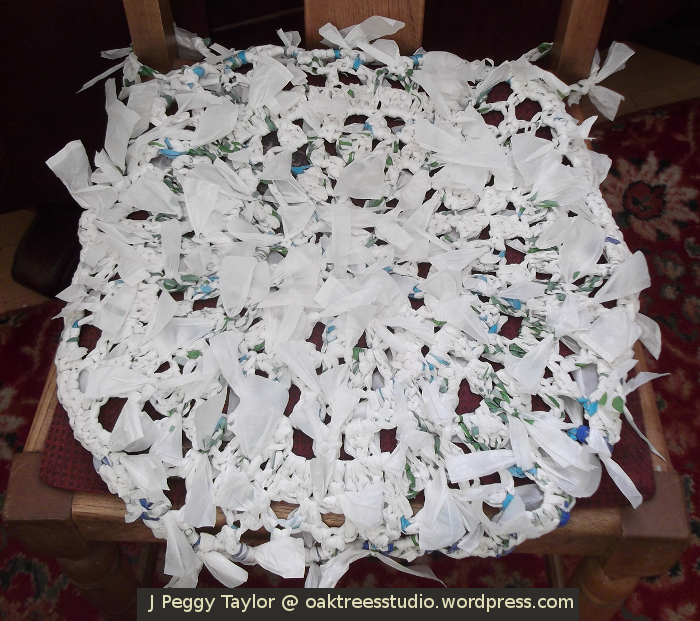 Some of my readers may remember last Spring that I made a crochet rug from supermarket carrier bags – I wrote about it here. 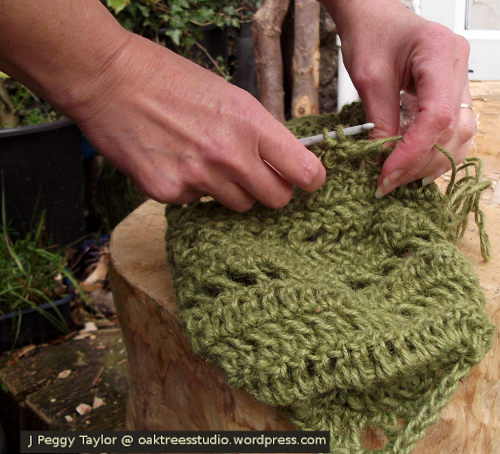 I have used a similar process, upcycling some carrier bags to make the crochet chair cover. It is basically a crochet circle that I finished it off with some simple crochet chain ties to hold it in place. I think it certainly tidies up the chair while it is waiting for its new hooky mat chair seat cover. 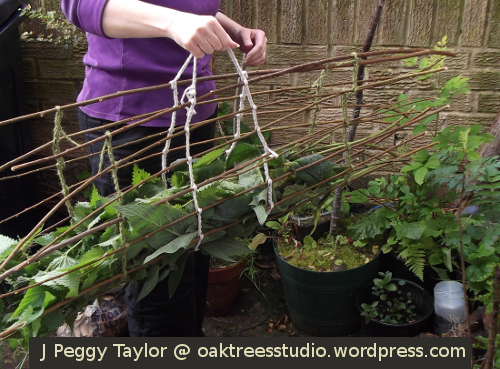 As well as continuing my hooky mat practice, I am now also making a simple trestle from hazel rods to act as a support for my mat frame when I begin working on my chair cover properly. I’ll post again on my hooky mat chair cover craft project when I make some more progress. When one of my favourite woolly jumpers became worn and raggy, I decided to give it a bit of a thrifty makeover. I’ve been sharing my progress on this craft project from time to time over the past couple of months. 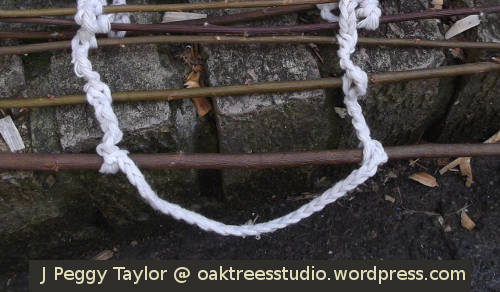 In my last post I was showing you how I’d darned the holes and caught up the ladders in the knitting using a crochet hook. I was then ready to sew on the bright crochet patches I’d made to fit each of the worn areas. To sew on the crochet patches I chose to use the pearl grey woolly yarn I’d used as the edging on the patches so that the stitching would be almost invisible. 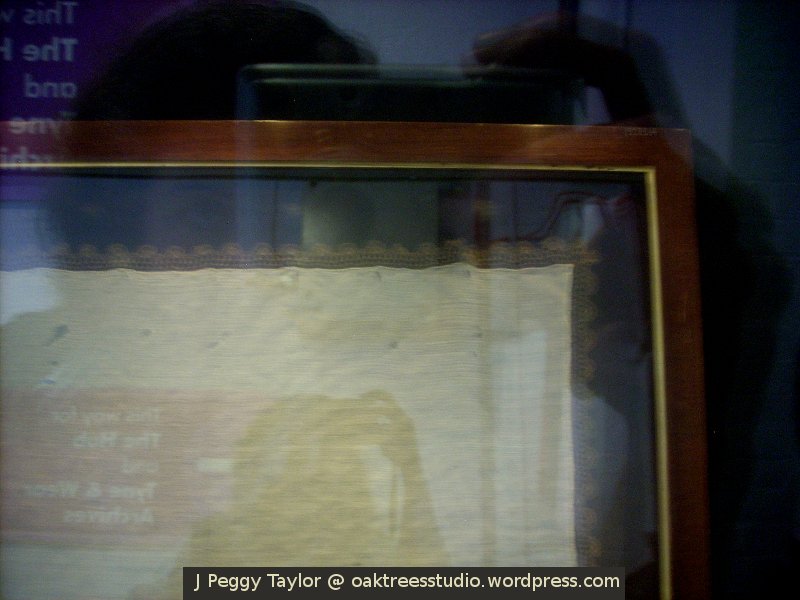 You can just about make out my oversewing stitches around the patches on the close-up image above. 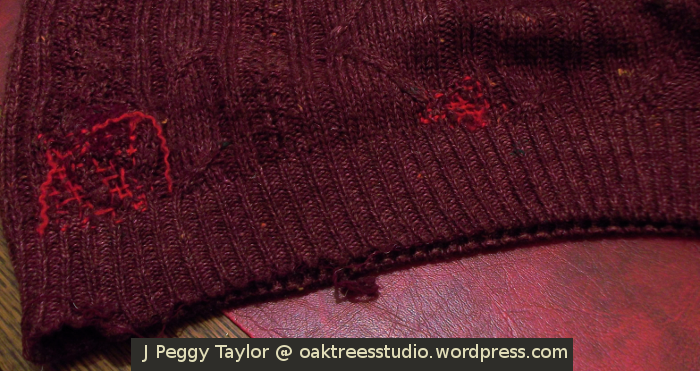 As I had hoped, the loosely woven darning reinforced the ‘holey’ parts of the jumper and helped retain the jumper’s shape while I was sewing on the crochet patches. When all of the crochet patches were sewn on, I hung up my jumper to consider how I felt about the overall look. I’d been pondering previously on whether the crochet patches would stand well enough on their own or whether they needed ‘a little something’ to help them hang together as a design. Now that I had all of the patches in place, I really felt they needed that ‘little something’. Whilst I was continuing my pondering, both my husband and son admired the ‘flowers’ on the jumper. Interesting! I hadn’t designed the patches as flowers, but I could definitely see the possibility. I decided to develop the design and have my ‘flowers’ growing out of the new border that I was planning to add to strengthen the lower edge of the jumper. 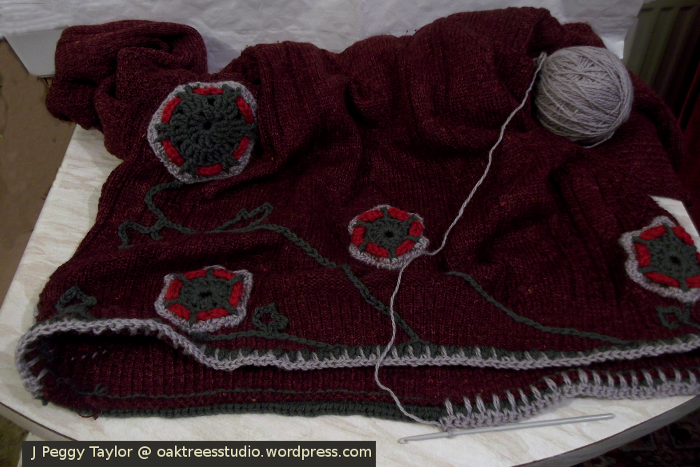 Using the dark grey yarn, I began by crocheting a line of chain stitches close to the edge of the jumper. I was careful to avoid any damaged parts of the lower edge as I didn’t want the border to easily pull away from the bottom of the jumper. 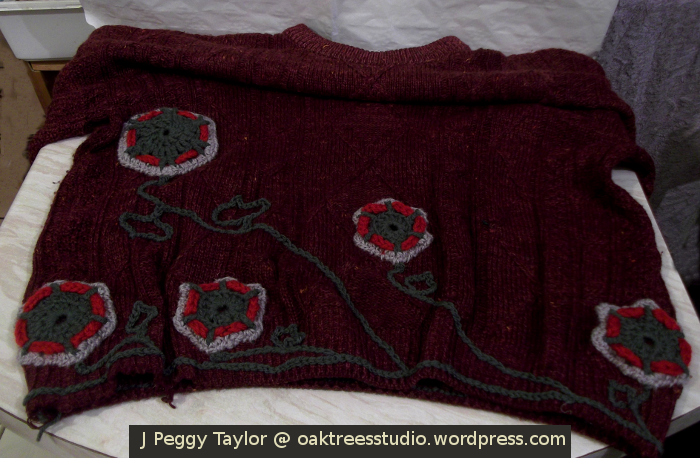 When I’d finished the ring of chain stitches around the bottom of the jumper, I began to add some stems and leaves to the ‘flowers’using crochet embroidery. To keep the finishing simple, I continued with the same dark grey yarn. 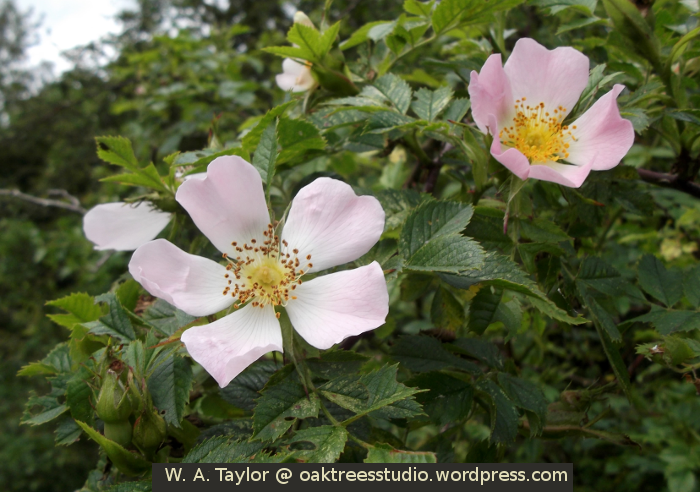 As the flowers are geometric and stylised, I developed the stems and basic leaf outlines in a similar stylised way. 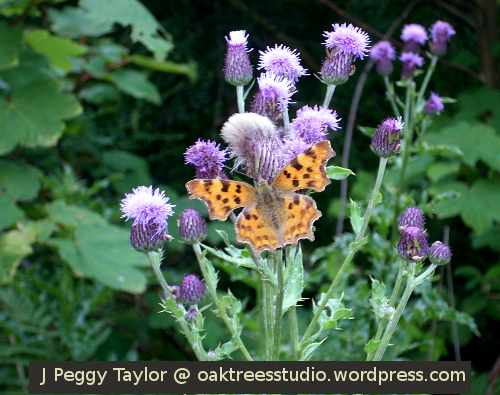 I think my leaves have also been partly influenced by another project I am now working on, harking back to the designs of the Arts and Crafts Movement and Art Nouveau. When I’d completed the crochet embroidery, it was time to consider how I might work the border around the lower edge of the jumper. The ring of dark grey crochet chain would form the point of attachment. Using the dark grey yarn and working into both loops of the crochet chain on the outside of the jumper, I crocheted a row of half treble crochet (half double crochet in US terms 😉 ). I then worked a row of spike stitch using the pearl grey yarn. As I worked each of the spikes, I pushed the crochet hook right through the jumper edge so that these stitches caught the original lower edge of the jumper and formed a binding row. Keeping with the alternating greys, for my next row I changed back to the dark grey yarn, again working in spike stitch and my final row of spike stitch was worked in pearl grey. To complete the new jumper edging, I worked a row of double crochet (single crochet in US terms), alternating between the two grey yarns on each stitch. I like the slightly woven and slightly tweeded appearance of my new and strengthened jumper edge. The edging is tougher than the knitted part of the jumper, but as the edge seemed to be wearing out in several places, I am hopeful that a stronger edge will help. 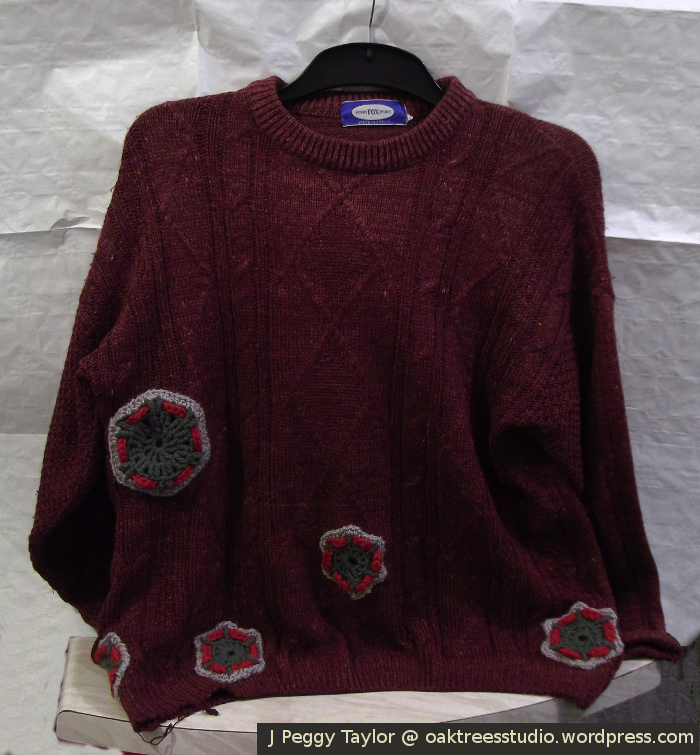 … and here we have the finished jumper! My jumper full of holes has been transformed into a unique garment for the cost of nothing but a rummage through my yarn oddments and a few hours of crochet. 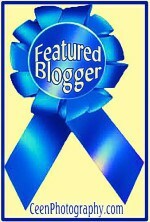 I am pleased with the way my thrifty makeover has turned out. 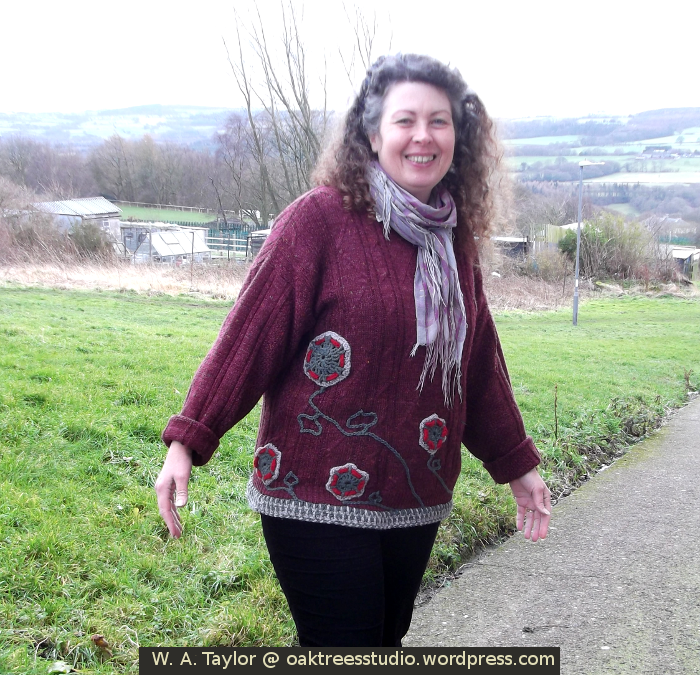 Now all the loose ends have been carefully tucked in and my favourite woolly jumper is finally ready to wear again! When one of my favourite woolly jumpers developed holes and was in need of some serious mending, I decided to give it a bit of a thrifty make-over. In my last post on this project I was showing you that I’d designed some colourful crochet patches to cover the unwanted holes in my jumper. I’d accepted that a subtle approach to mending was no longer a possibility on my well-worn woolly. Creating the crochet patches didn’t really take too long, but then time ran into mid-Winter festivities and now here I am ready to progress with this thrifty mending project, especially as warm woolly jumpers are currently an essential item of clothing for our chilly January days. Before sewing on the crochet patches, I wanted to increase the stability of the underlying knitted fabric. 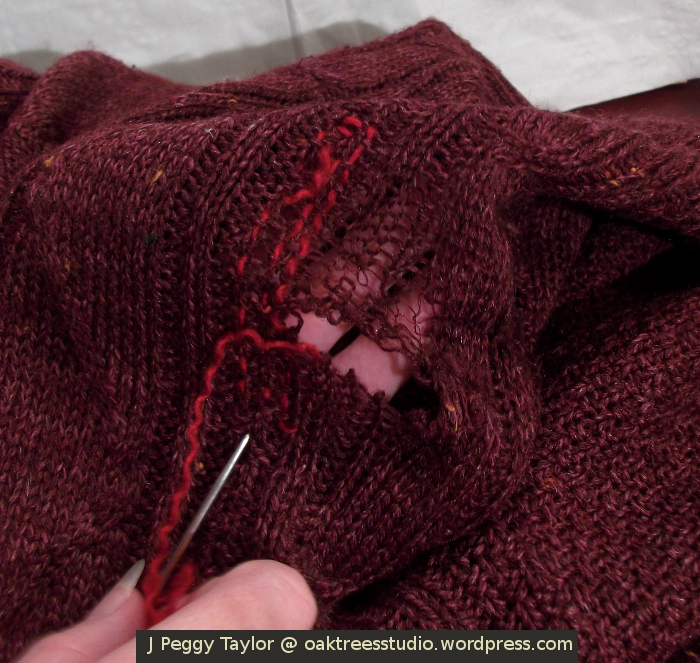 To do this, I chose to make a preliminary darn of each holed area of the jumper. The darned areas would then be covered over with the crochet patches. 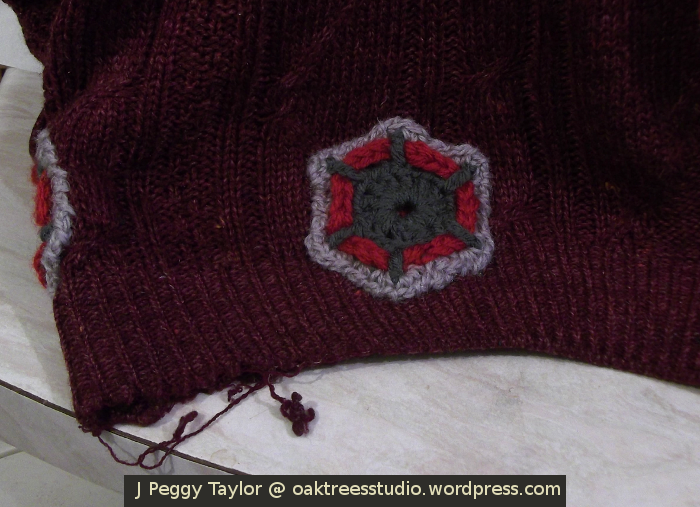 For the darning, I used some odd lengths of red double knit yarn I had left from creating the patches. First I stranded the yarn – separating it into its three constituent yarn threads as I wanted to work with thinner yarn than the original double knit. Using a darning needle, I worked my way across each of the damaged areas. I darned quite loosely as I didn’t want a really dense fabric underneath the patches. 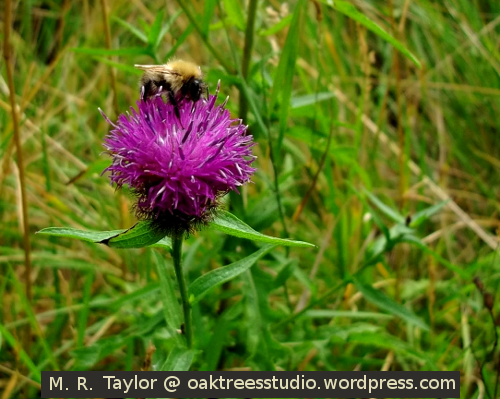 The images in the gallery below show you this process. On my jumper, I had identified that some of the holes also had ladders running from them and the knitting loops had come undone. I’d noted the ladders on my mending plan. 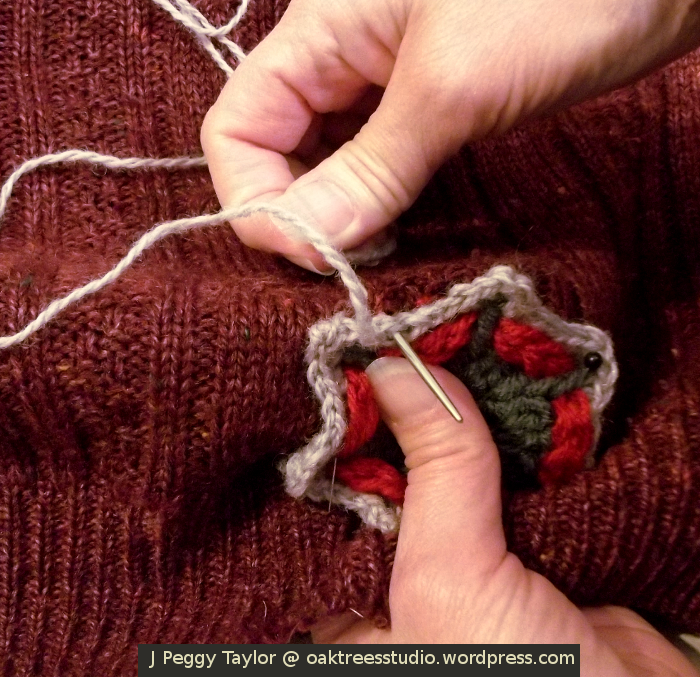 It is a fairly simple process to mend ladders in knitted fabrics using a small crochet hook. I chose a 1.5mm hook for this task. You start by finding the loop wherever it is lurking at the bottom of the current ladder and insert the crochet hook into it. 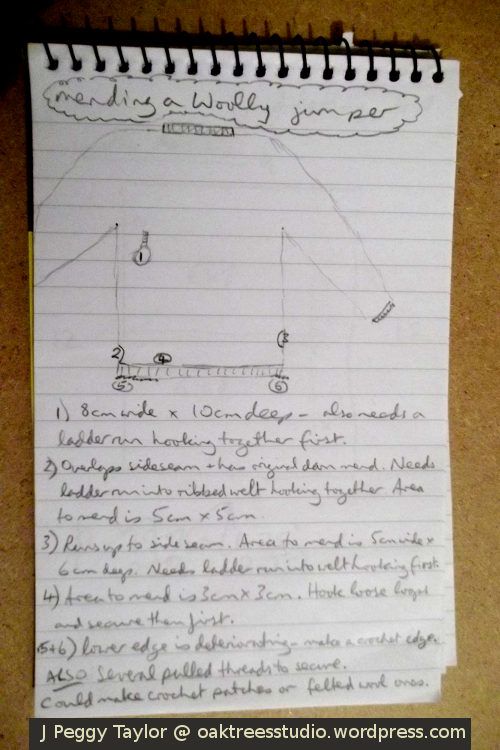 Then it is simply a case of hooking through each successive ‘lost’ knitted loop, working your way towards the top of the ladder. 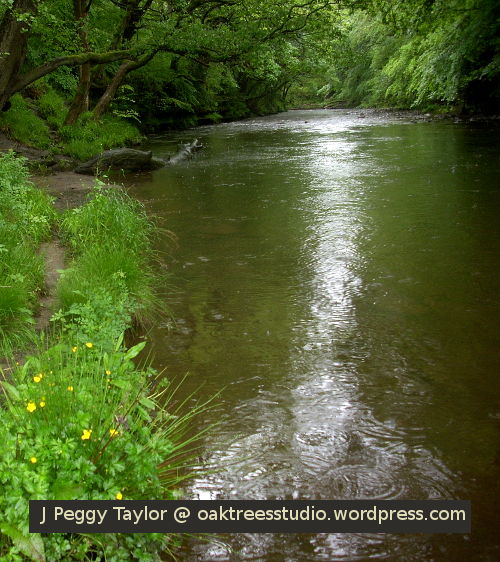 You can see this process in the gallery of images below. When you’ve caught up all of the ‘lost’ knitted loops, it’s best to leave the final loop on the crochet hook until you have your darning thread ready to catch down the loop and secure it. Now that all of the holes have been secured by darning and the ladders have been repaired and their loops sewn in, I am finally ready to begin sewing on the crochet patches. Next, I’ll be sewing them all in place, again using the darning needle, but this time I will use a length of the pearl grey yarn I used to edge the crochet patches and this will make my stitching invisible. When I have sewn on all of the crochet patches, there’s still another part to this thrifty mending project, as the lower edge of the jumper needs tidying up too. 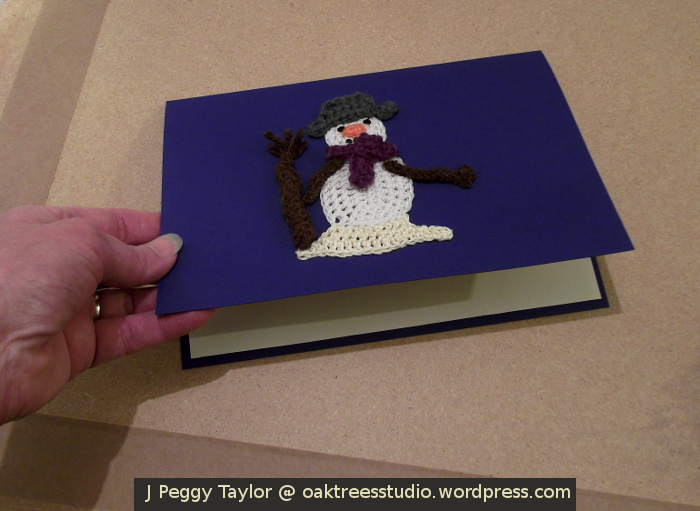 Hopefully I will have that done soon and then I shall show you how my Mending a woolly jumper project has turned out. 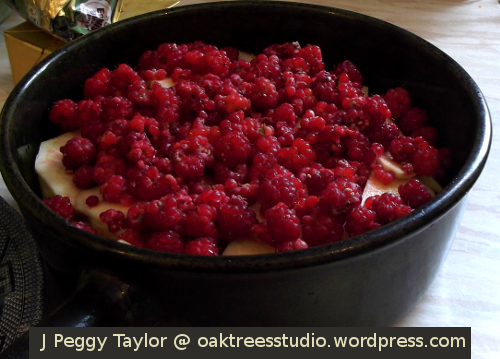 The pre-Winter makeover I planned for my well-worn woolly jumper is slowly making progress. 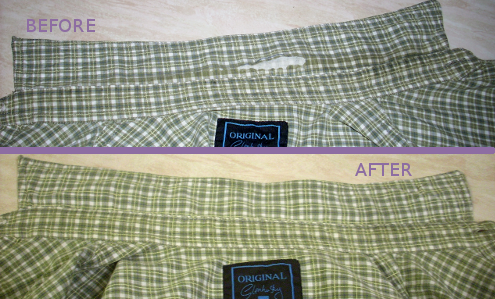 When I introduced you to this thrifty mending project, I had conducted Task 1 – an analysis of just how much jumper was damaged or missing altogether. My next task was to determine what materials and methods to choose to begin the mending process. Due to the quite extensive work needed to repair this garment, I decided two things. Firstly, although previously I had successfully darned this jumper, this time there was no way the mending could remain unobtrusive. 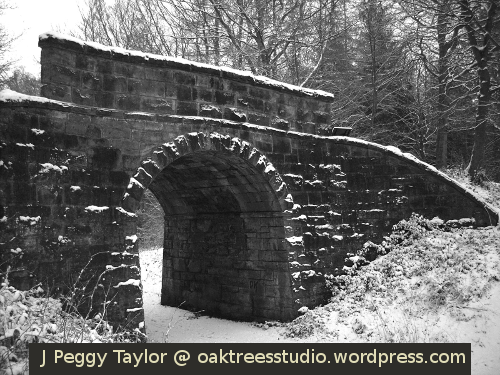 Secondly, since the jumper is worn mainly for outdoor work, it seemed sensible to minimise any spending on this project. 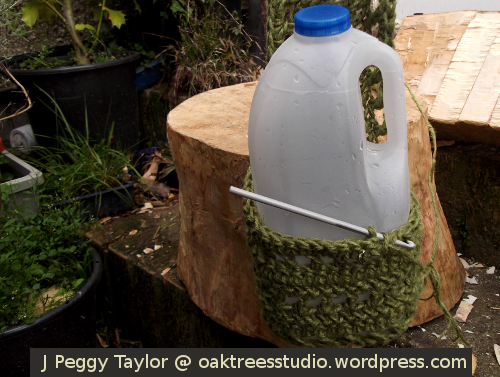 I was sure I could conjure up enough yarn from my scraps stash to mend and reinforce the worn areas, hopefully with a bit of imaginative design to lend a more ‘cared for’ impression to this well-loved old woolly. My variation on a hexagonal motif with a bright edge for my woolly jumper patches. As a method of repair, crochet patches seemed an obvious choice for me. This way I can match the motif size to the size of repair needed. Accepting that ‘unobtrusive mending’ was not going to happen, I decided to go for something bolder. A rummage through my yarn scraps stash yielded some bright red yarn, left over from a pair of cosy indoor socks I’d crocheted recently. 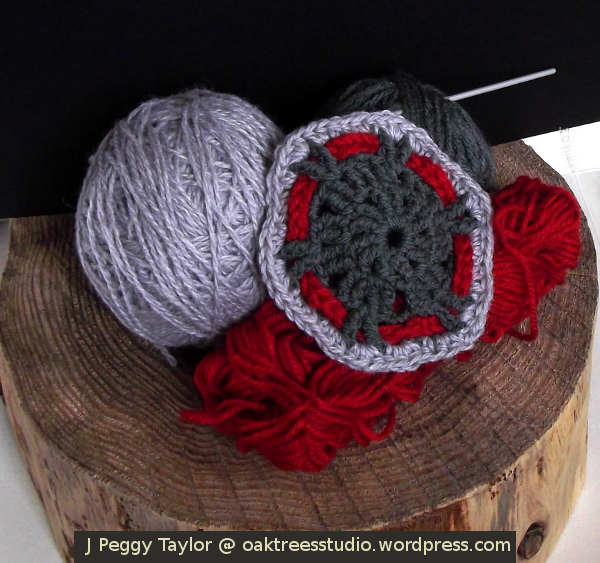 I thought the red teamed up well with some smooth dark grey yarn and to make a defined edge to the patches I found some woolly-textured yarn in pearl grey. The crochet motif I’m using for the patches is a basic hexagon. 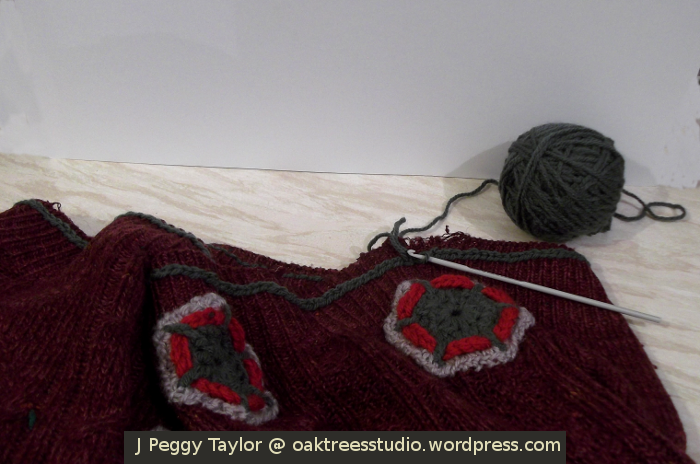 I began with the dark grey and worked the centre of the hexagon before adapting the final row to suit the size of motif I needed. To firm up the outer edge of the motif, I worked a row of double crochet (that’s single crochet in the US 😉 ) using the pearl grey yarn. The red highlight is a simple crochet chain worked in a double thickness of yarn and then woven in and out around the hexagon frame. To adapt the pattern to create the different sizes of patch, I’ll work the pattern in different sized crochet stitches and probably use different numbers of rows. I made my first crochet patch for the largest hole in the jumper. 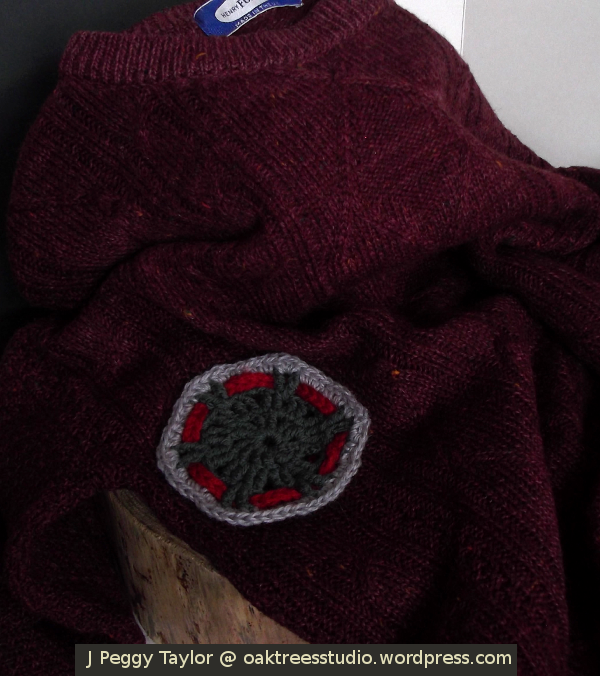 When I tried out the motif, I liked the contrasting colours against the dark maroon of the jumper. I think this idea is going to work. 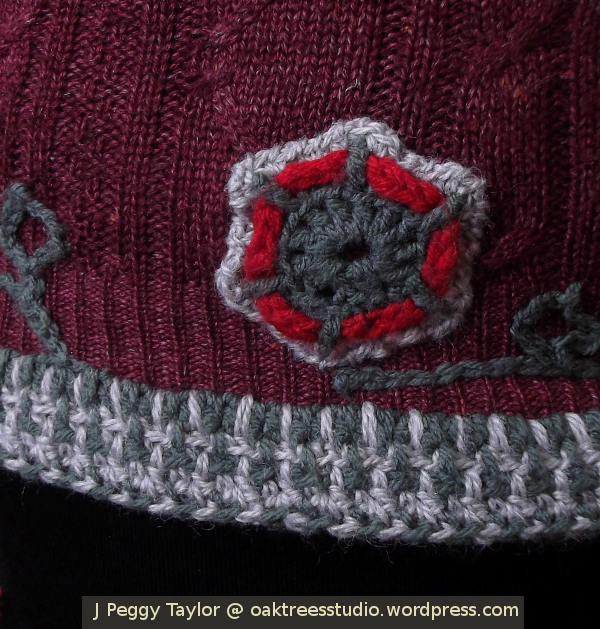 I shall continue my woolly jumper mending project, creating the remaining patches using the same style of motif. Hopefully it won’t take too long to hook up the crochet patches and then I’ll show you how the patching looks.